Reference number for this case: 4-Oct-54-Jaleyrac. Thank you for including this reference number in any correspondence with me regarding this case. Didier Gomez discusses an observation on October 4, 1954, an ovoid wingless shape, said to have occurred to Lavaur. "A resident of Jaleyrac (Cantal) reported an observation in Lavaur. After investigation, it appeared that this good man had made an observation in Lavaur, in the Tarn. The facts wrongfully located by the press of the time at the canton's main town or the locality of residence of the witness 'constitute a considerable quantity'." He says that this information published in "La Montagne" of Aurillac for Friday, October 8, 1954, was initially wrongly put in the Cantal, according to INFO-OVNI, #0, of April 1975, in an article by Jean Giraud, according to a communication from Claude Maugé. He indicates that according to these thin known data thanks to the help of Claude Maugé, he tried to find the article, that he found by a simple mail addressed to the Departmental Files of the Cantal in February 2003. Several hundreds of testimonys of residents of Mauriac are mentionned, they claimed to have observed an ovoid form without wings, nor fuselage which was shining in the sun as if its external surface were of nickel. "But my curiosity having been waked up, I collected Wednesday morning, at the time of a large gathering of people attending funerals, a highly impartial testimony emanating from a farmer of the area of Jaleyrac. Whereas he was near the pond of Lavaur, Monday at the beginning of the afternoon, a machine appreciably similar to that which intrigued the population of Mauriac so much, flew over the area at high altitude, very high speed. Neither noise, nor smoke; saucer shape, or rather, my interlocutor specified to me, of a kind of brilliant parachute. All that does not add many things to what is already known about the flying saucers. But our vital space air is now violated by the flying saucers". 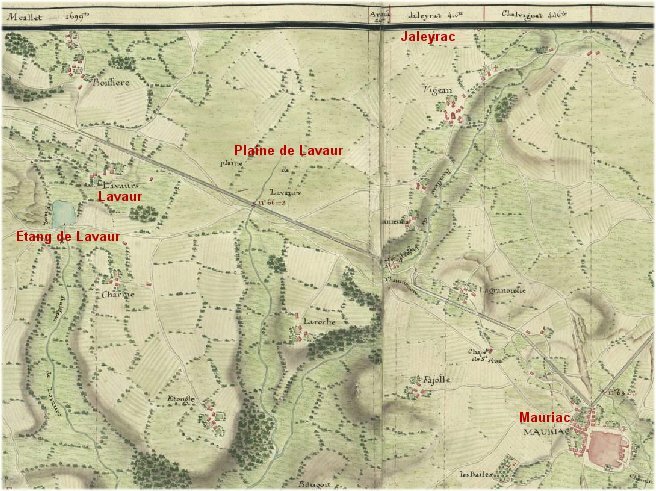 He indicates that his checking made it possible to find that there is a village of the name of Lavaur, near Meymac, at 7,5 Kms in the west of Ussel, in the department of Corrèze, within 36 km in straight line from Jaleyrac. This farmer could thus very well have made his observation from a lake close to Lavaur either the Sèchemailles lake or the pond of Merlançon both at a few kilometers of the locality of Lavaur. He nevertheless found no trace of a pond of Lavaur neither in Corrèze, nor in the Cantal, and it appears increasingly certain to him that it is indeed a case of the Corrèze and not of the Tarn as wrongly suggested by Jean Giraud in the first issue of INFO-OVNI. He specifies that the information reported in the press is about a farmer of the area of Jaleyrac, which reinforces him in the idea that this pond is very close to Mauriac and Jaleyrac. He puts this observation in relation to testimonys at Mauriac mentionned in the same Press article, which implies that the observation was limited to this same area and not in Lavaur in the Tarn, distant of almost 230 kms from Mauriac in straight line. He notes that these few additional precise details do not make it possible to decide on the nature of the described observation. Jaleyrac is in the département of Cantal, canton of Mauriac, bordering the department of Corrèze. There is in Jaleyrac an "Inn of the Pond of Lavaur". Lavaur - or Lavaurs circa 1700 - was a hamlet depending of Jaleyrac in the Cantal, between the hamlets of Boissière and Charme. The pond of Lavaur is indeed in the Cantal, just in the south-west of the hamlet of Lavaur, in the east of which is the the plain of Lavaur. [---] Article by Jean Giraud in the ufology bulletin INFO-OVNI, France, #0, April 1975.